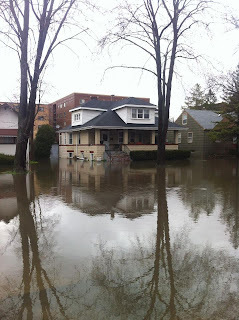 The Caucus Blog of the Illinois House Republicans: Flood Watch - Updated April 22 at 4:30 p.m. 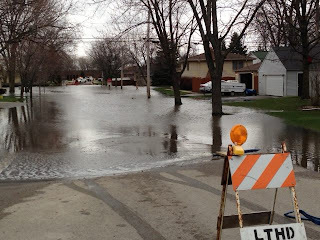 Flood Watch - Updated April 22 at 4:30 p.m. Governor Quinn has declared a disaster exists within the State of Illinois . Update by IEMA - Monday, April 22 @ 4:30 p.m. 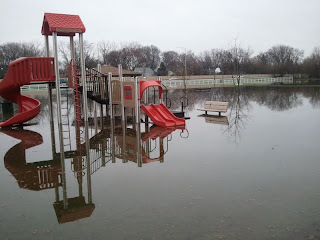 Widespread flood fighting efforts are ongoing along the Illinois and Mississippi Rivers; low-lying areas in several locations on these are currently being threatened. 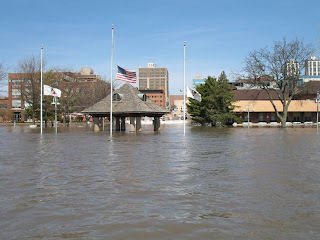 Residential areas, agricultural land, and key infrastructure such as water and wastewater treatment plants are currently at risk, and the State is supporting sandbagging and pumping operations as required. Some flood fighting efforts continue along the Fox, Des Plaines, Rock and Spoon Rivers; recovery operations are also beginning in these areas. Response activities along creeks and streams impacted by flash flooding earlier in the week have concluded and recovery is ongoing in these areas. Widespread rain is forecast for the next two days increasing chance of river rise and additional flooding. 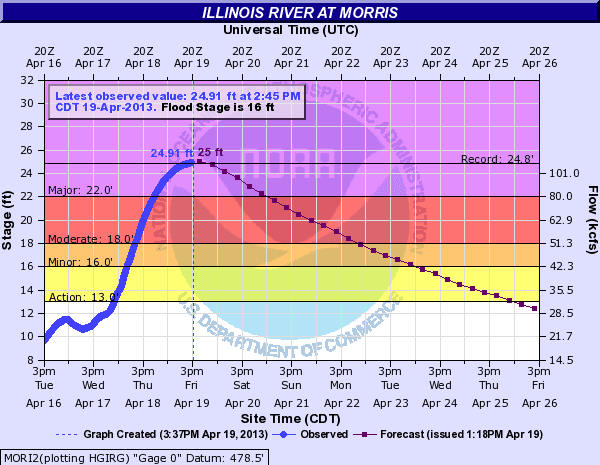 NWS has issued revised crest level projections for the Illinois River South of Havana. These are running 12 to 18 inches less than previous forecasts. Several loose barges remain stuck against the Lock and Dam at Marseilles. 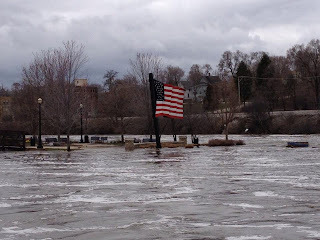 A USACE Safety Specialist has inspected the scene and determined that while this is a less than desirable situation it is not creating any additional issues with regard to the overall flood situation. Engineering personnel continue to monitor the situation to ensure it is remaining stable. Evacuations are being conducted in at risk areas and being lifted once the threat has passed. ARC is ensuring sheltering and feeding operations are in place to support all evacuations while citizens are displaced. 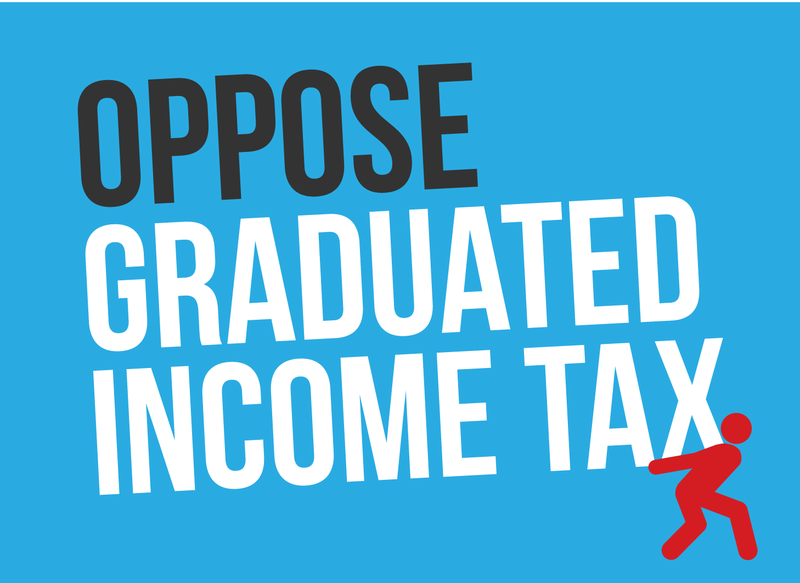 Some good news to report - Monday, 3:45 p.m. 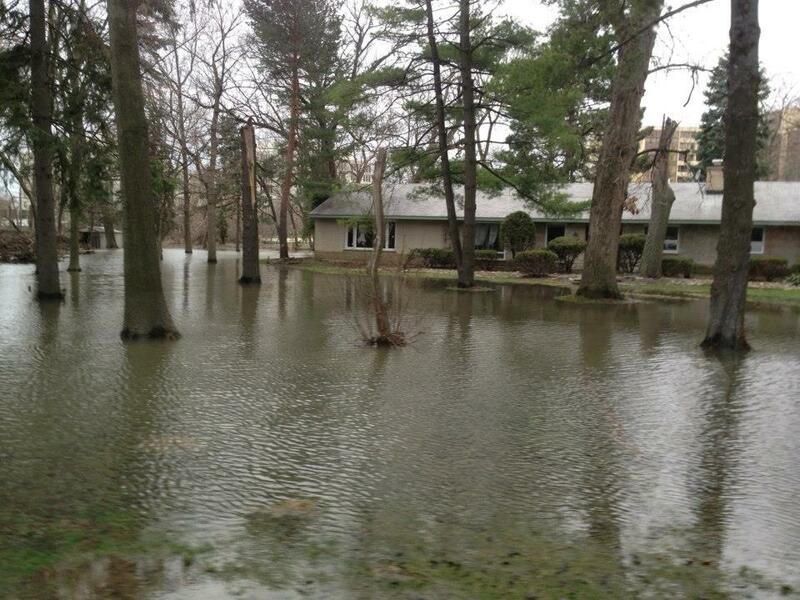 The Des Plaines River has reached crest and begun to fall at every gauge along its length. 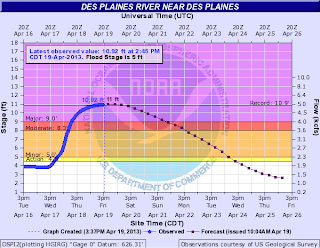 While still above flood stage, the Des Plaines has dropped almost a foot at Gurnee and Lincolnshire since Saturday, and more than two feet at Riverside. 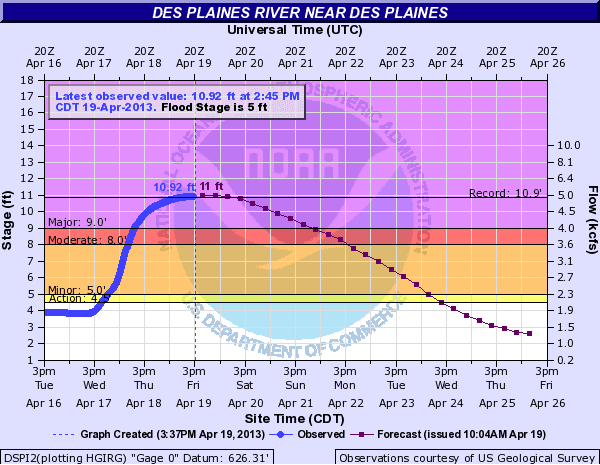 The Des Plaines should fall below flood stage at all three points late Wednesday or early Thursday. 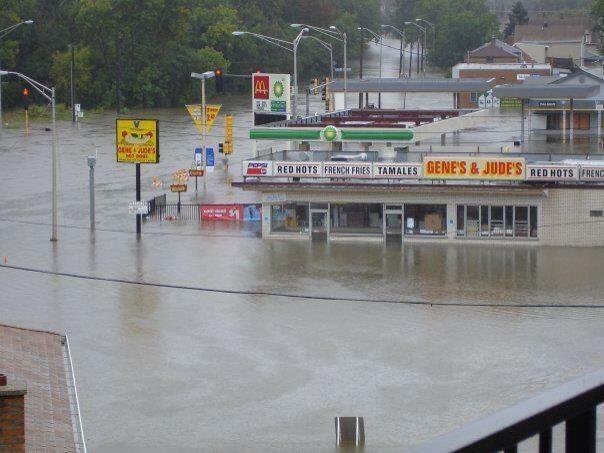 The Fox River has crested at McHenry and Algonquin, and continues a gradual fall at Montgomery and Dayton. 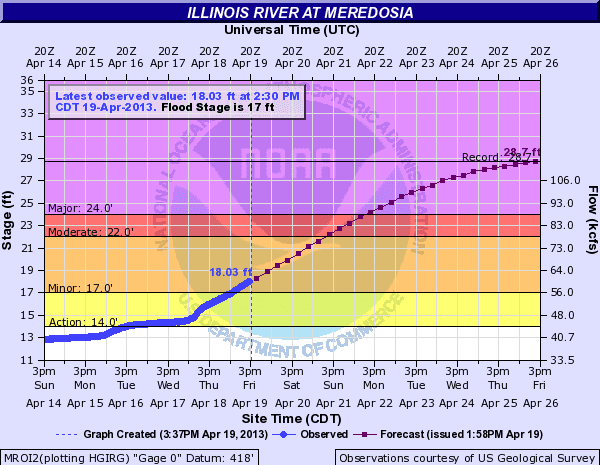 The Spoon River in western Illinois has dropped more than eight feet at Seville since Thursday, and it should be back below flood stage by Wednesday. The LaMoine River has also dropped by close to eight feet at Colmar, and should be below flood stage possibly as early as tonight. 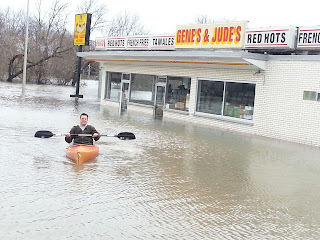 Meanwhile, on the Illinois River, the situation is still difficult, but not quite as bad as previously thought. From Havana southward, while the river continues to rise to dangerous levels, the forecast has been revised slightly to indicate a crest about one foot lower than previously anticipated. It remains to be seen what effect tonight and tomorrow's forecasted rainfall will have. The View from Peoria, courtesy of IEMA - Monday 3:45 p.m.
Monday flooding updates - 4/22/13, 1:30 p.m.
IEMA reports that it is concluding its efforts in response to smaller creeks and streams which were heavily affected by the flash flood following last Thursday's heavy rain. Now, as the floodwaters continue to drain into the state's river system, the state is continuing its flood fighting operations along the Fox, Des Plaines, Rock and Spoon Rivers, and escalating its efforts along the Illinois and Mississippi. 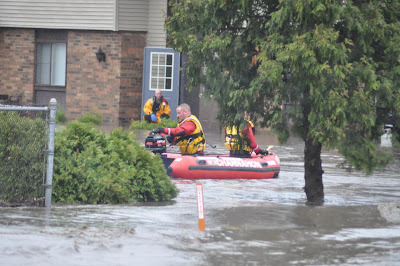 Crews from the Department of Corrections are working in Schuyler, Pike, Morgan and Scott counties to assist local efforts at protecting communities from floodwater. 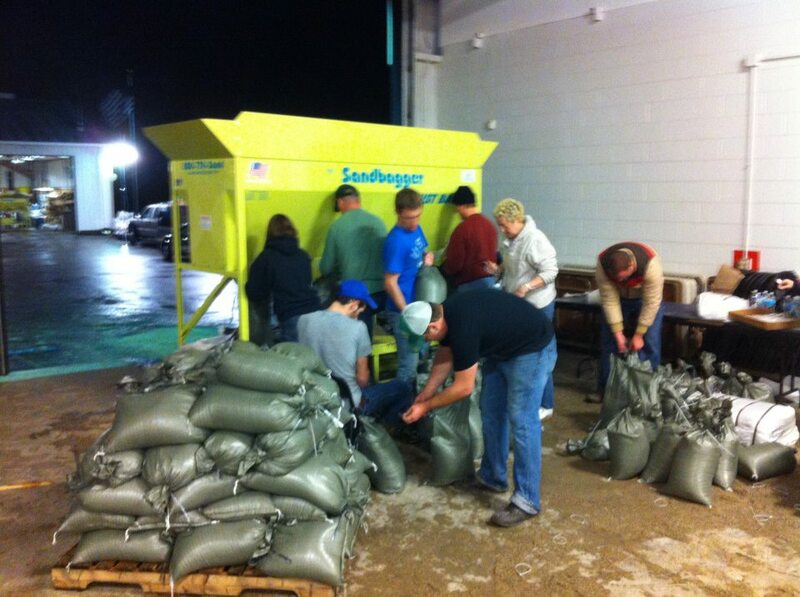 In addition, inmates at several correctional centers are filling sandbags to be transported to threatened areas. Sandbags are being filled and transported from East Moline Correctional Center, Western Illinois Correctional Center, Jacksonville Correctional Center, Greene County Work Camp and Pittsfield Work Camp. 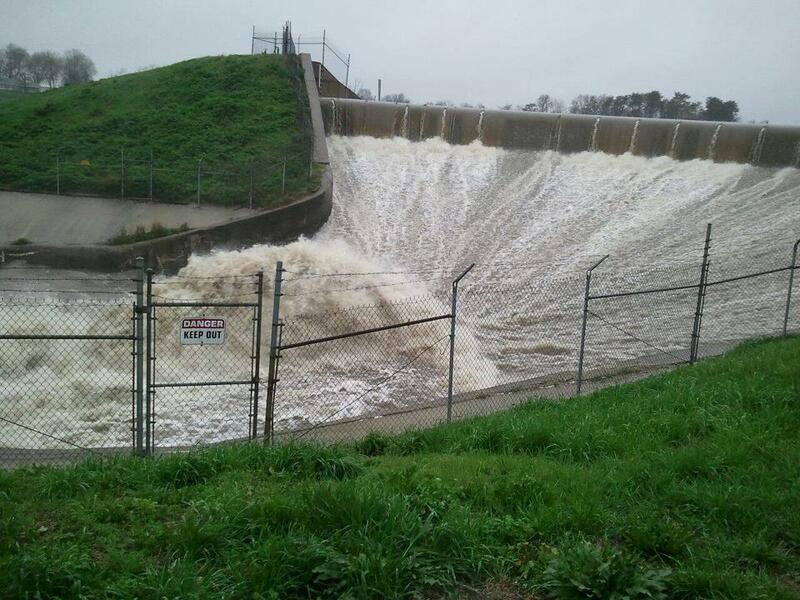 So far, IDOC reports that 439 inmates have filled over 60,000 sandbags since Friday. The Department of Transportation says it has deployed 700,000 sandbags with plastic sheeting to threatened sites across the state. IDOT has assisted with trucks for sand hauling, barricade placement, road closures, signage and message boards for detour routes. 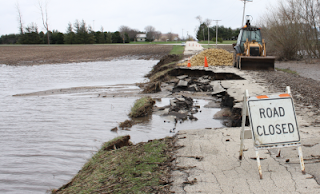 IDOT also says it has deployed 49 pumps to local governments which have requested them. 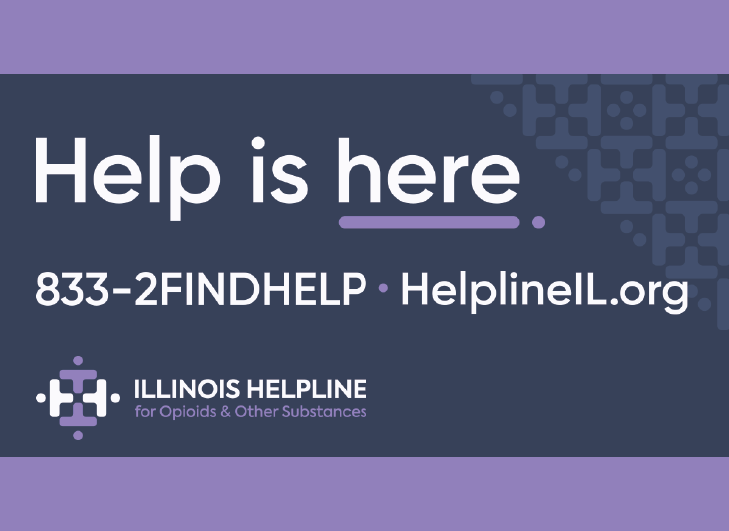 In Henderson County, an 8-foot wide breach opened in a levee near the city of Oquawka in the area of Illinois Route 164 and Schuyler Drive. There are eight homes and restaurant in the affected area according to IEMA. While the Mississippi reached its crest and started to fall at Quincy, the Memorial Bridge remained closed today because of high water affecting the roadway leading to the bridge. The U.S. 54 bridge over the Mississippi in Pike County was also closed. Drivers were being detoured onto U.S. 61 and U.S. 36 to cross the Mississippi at Hannibal. Rising floodwaters caused several barges to break free south of St. Louis early this morning and crash into the Jefferson Barracks Bridge, which carries Interstate 255 across the Mississippi. The Missouri Department of Transportation has completed its inspection of the bridge and has reopened it to traffic. 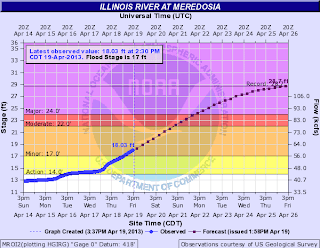 According to the forecasts from the National Weather Service, the Illinois River will crest at record levels in Henry on Monday, Peoria Tuesday and Havana and Beardstown Thursday. 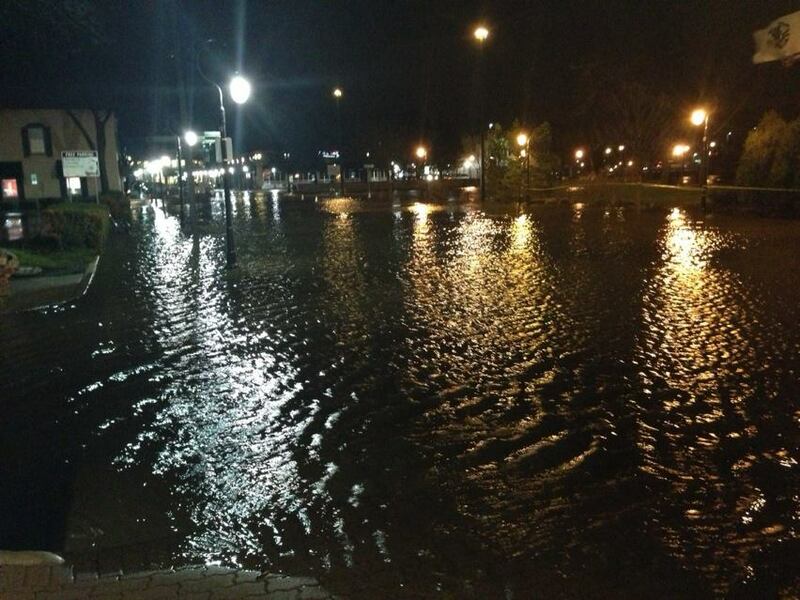 The Wabash is expected to hit Major Flood level below Terre Haute on Monday. More rain is expected Monday night and Tuesday, possibly as much as one inch, worsening the situation across the region. 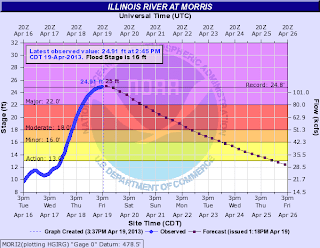 Flooding Assistance Process - 4/20/13 - 10 a.m.
For continued updates on the flood response, visit www.ready.illinois.gov - 4 p.m.
Illinois River begins to fall at Morris, but water flows downstream and causes rise at Meredosia - 3:40 p.m.
Kishwaukee reaches crest and begins to fall at Belvidere - 3:40 p.m.
Des Plaines River begins reaching crest in northwest suburbs - 3:40 p.m. 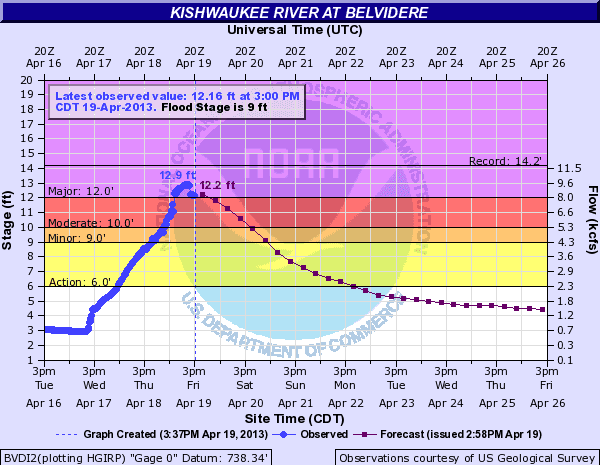 The river should begin to fall overnight, according to projections from the National Weather Service. 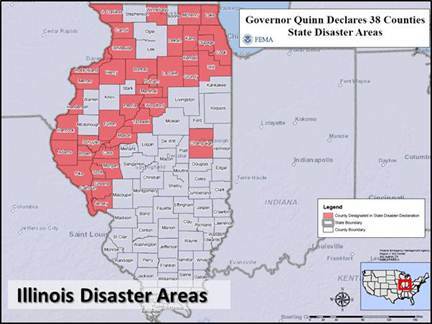 Map of the 38 counties which have been declared state disaster areas by Governor Quinn - 3:35 p.m. Some new photos are posted at the bottom of this page - 3 p.m. 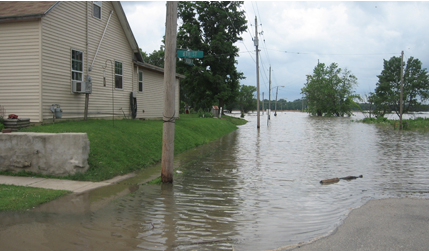 Does your community participate in the National Flood Insurance Program? 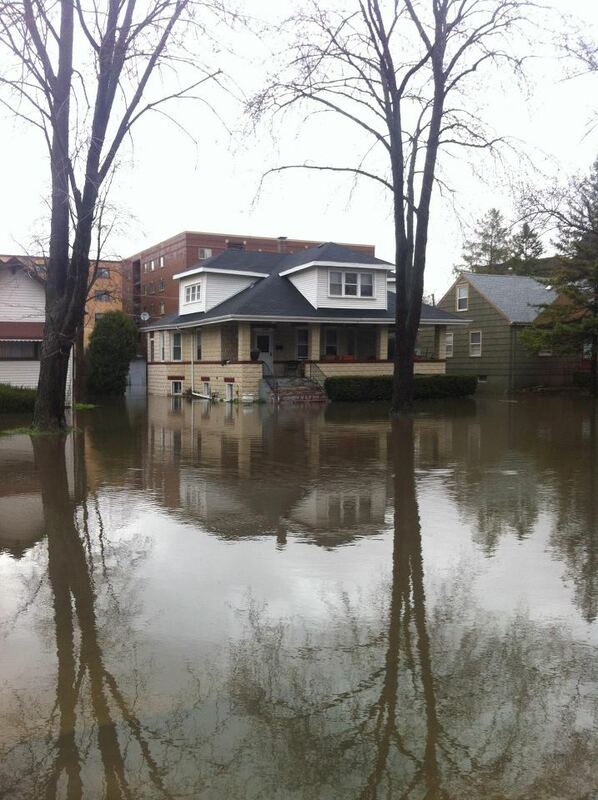 - 2:35 p.m.
For information on the National Flood Insurance Program, visit www.floodsmart.gov. Storm totals from the Chicago area - 2:15 p.m.
Naperville leads the list with 7.34 inches recorded from Wednesday to Thursday. 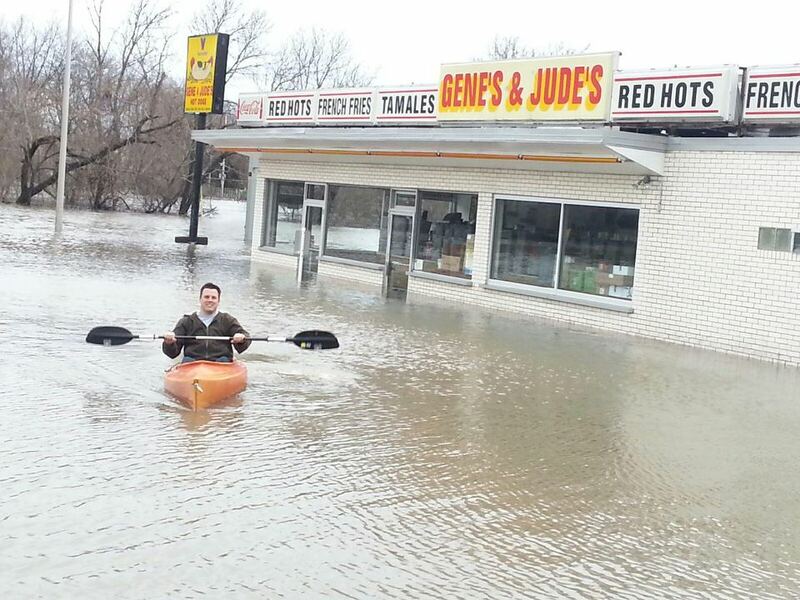 Some flood safety tips - 2:00 p.m.
Seek higher ground. Do not wait for instructions. Be aware of flash flood areas such as canals, streams, drainage channels, and underpasses. Be ready to evacuate with your Go Bag. If time allows, move essential items to upper floors. If instructed, turn off main valves and switches. Avoid electrical equipment if you are wet or standing in water. If you must leave your home, do not walk through moving water. Six inches of moving water can knock you off your feet. Do not try to drive over a flooded road. If your vehicle stalls, abandon it immediately. 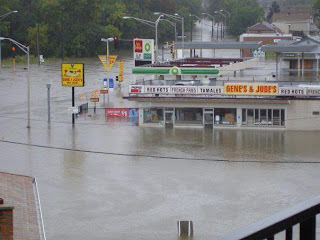 Avoid floodwaters. Do not let children play in the water. 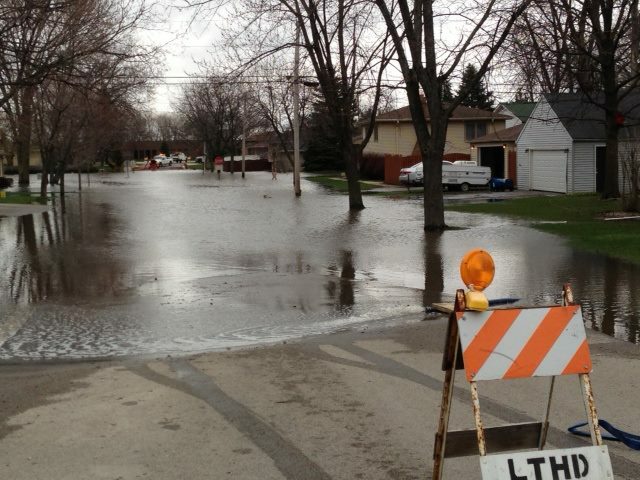 Be aware of areas where water has receded. Roadways may have weakened and could collapse. Avoid downed power lines and muddy water where power lines may have fallen. Return home only when authorities say it is safe to do so. Discard food that may have been contaminated. Check on sewage systems. If damaged, these can be a serious hazard. Peoria-area updates from the Journal-Star - 1:45 p.m. The Peoria Journal-Star is compiling updates from twitter users in their area at http://www.pjstar.com/free/x1431010767/Flooding-updates-on-Twitter-peoriawx. A levee on the Spoon River near London Mills was overtopped last night, and there is widespread flooding in the Peoria-area. 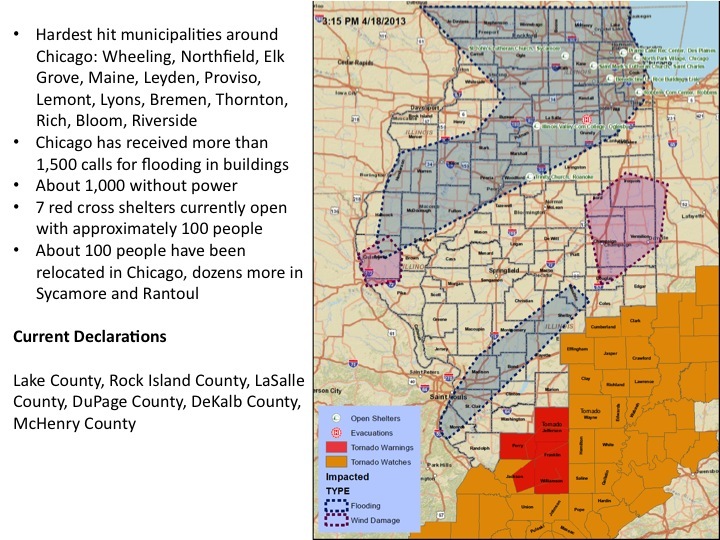 IEMA releases updated list of shelter locations - 1:30 p.m.
65000000Dupage County opened the shelter- Red Cross supporting as needed. Updated list of road closures from the Illinois Department of Transportation - 1:10 p.m. Check back to this link throughout the day as IDOT announcees road closures. The most recent update was just posted at 1 p.m.
State Police reporting road closure on I-55 in the Joliet area - 12:55 p.m.
Of particular interest to those from northeastern Illinois who are in Springfield for session and planning to head home this afternoon: the Illinois State Police report the northbound lanes of Interstate 55 are closed just south of U.S. 6. The road is closed between Interstate 80 and U.S. 6 and traffic is being rerouted onto U.S. 6. I-55 North has been closed to traffic at mile marker 248 due to flooding of the roadway. All traffic is being routed east on U.S. 6. ABC 7 updated list of closings in the Chicago area - 12:45 p.m.
Metra reports running normally - 12:45 p.m.
Metra reports that service on its lines in the Chicago area has returned to normal. The only remaining closure is the Berkeley station on the Union Pacific West Line. 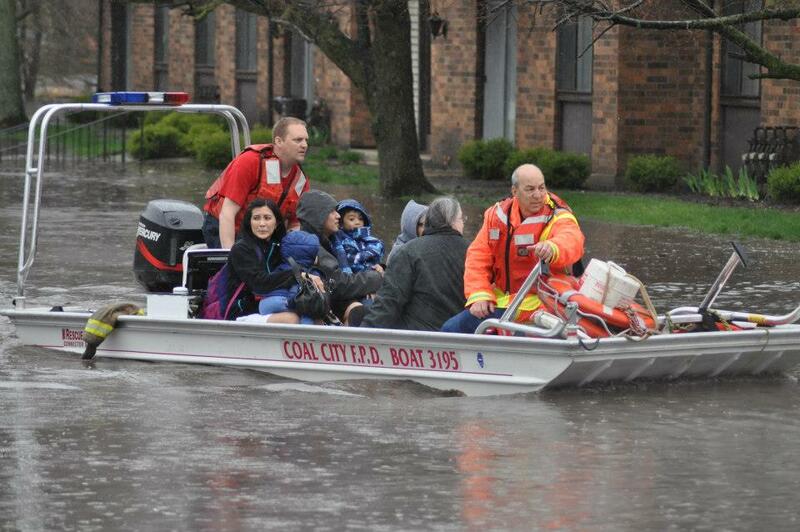 Kane County OEM reports on Fox River - 12:45 p.m. 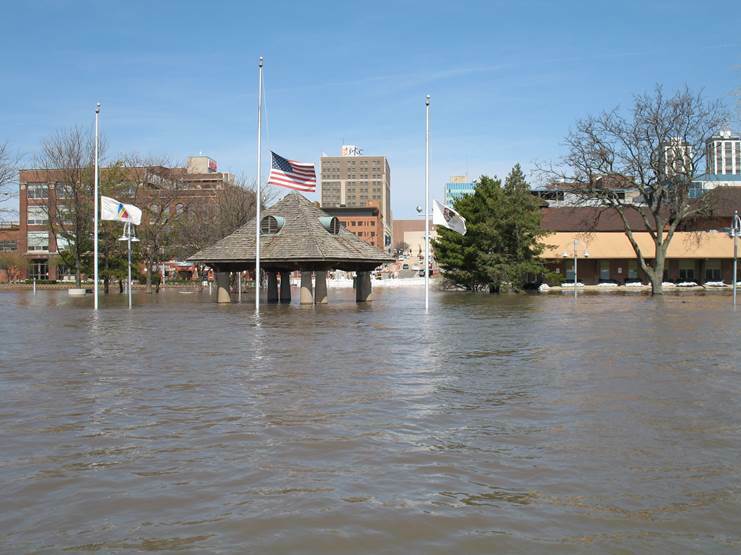 The Office of Emergency Management in Kane County told the Tribune that the Fox River continues to rise, but should reach its peak late Saturday night at around 13 feet. That level would not be a record, but would bring a comparable level of damage to that seen in the 2008 flood. 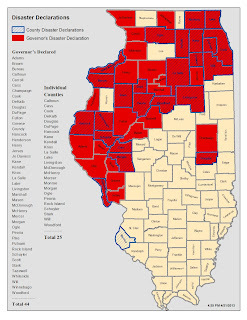 Updated information for county emergency management agencies - updated 11:30 a.m.
April 19 Briefing from IEMA to Illinois Legislators - 8:30 a.m. 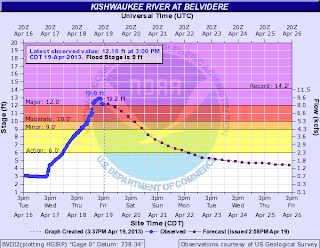 The DesPlaines, Fox & Illinois rivers continue to rise and are at record levels. They pose flash flooding concerns. 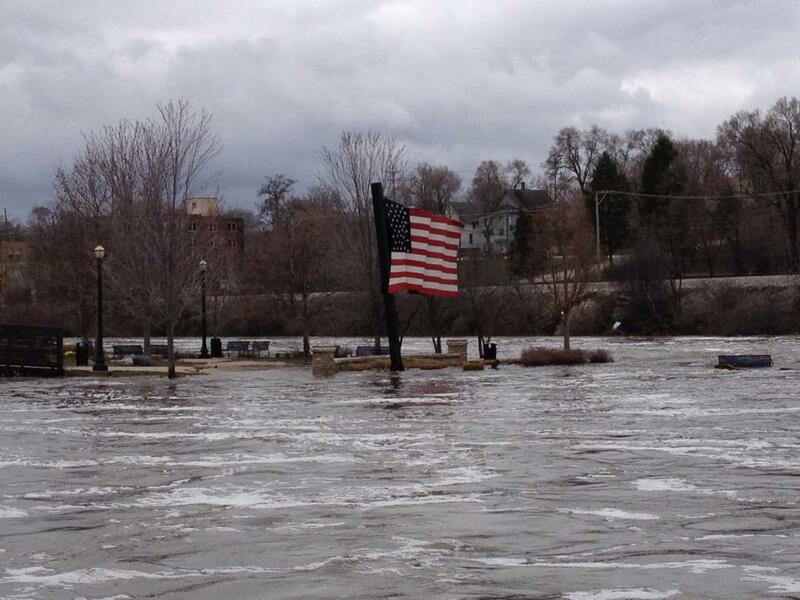 The Rock river is holding its own and isn't a major concern at the moment. 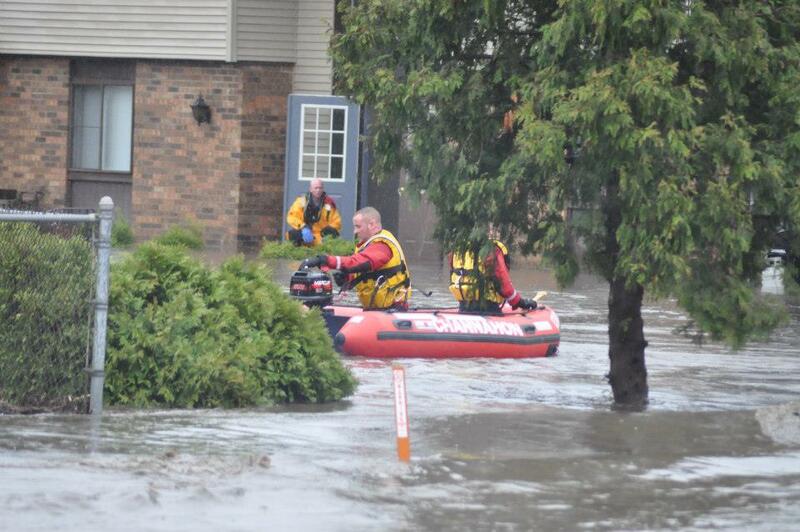 IEMA is working to shore up the Mississippi. One flood-related fatality was reported, a farmer in Jersey county who was cleaning out a culver was pulled under and tragically drowned. Roads are getting better with fewer closures and expect to continue to improve. Residents should report damage to their local emergency management organizations - typically based with counties. The state is fielding requests from local authorities for sandbags, help with sandbagging efforts and pumps. Emergency Closing Center provides the status of Chicagoland area schools, businesses daycare centers and organizations. Yesterday, the Governor activated the State Incident Response Center (SIRC) in Springfield to assess flooding and severe weather in the state. SIRC will provide support local public safety officials as they assist those affected by flooding. We will pass along information from SIRC as we receive it. Fire departs from around the area help evacuate residents in Morris, IL.